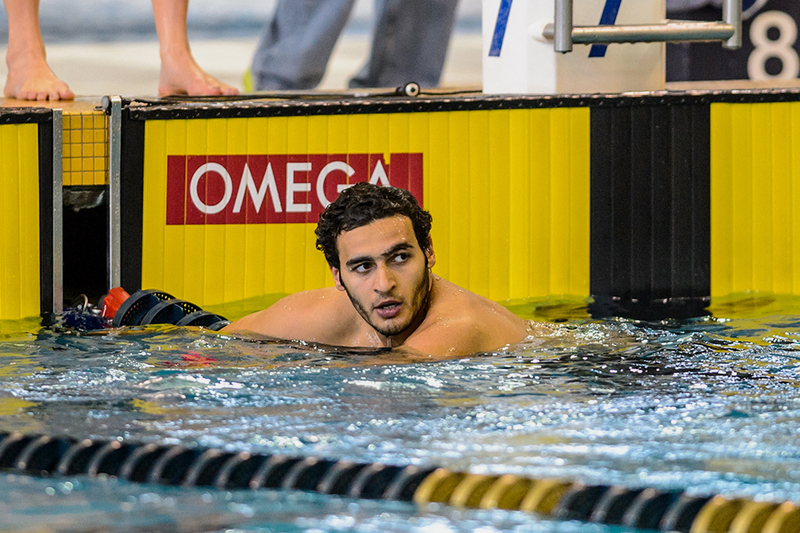 The Technique spoke with senior swimmer Youssef Hammoud to discuss the current swimming season and his transfer from Auburn last year. Originally from Egypt, Hammoud specializes in the freestyle and butterfly events. Technique: When did you start swimming and why? Hammoud: I think I started swimming when I was five. And “why” is because my sister used to swim, so I was around it all the time. She’s four years older than me. I was always with my mom when she was with my sister at practice, so I was always around the pool. [My sister] started telling my mom that I should swim too, so my mom put me in swim lessons. Also, my uncle has a pool at his house, and I always liked to play around. But at the time, I didn’t know how to swim, and everyone else was busy doing something else. I really wanted to get in, but nobody wanted to get in with me. So my uncle got very upset, stood up, held me and then he threw me in the pool. He told me you wanted to be in the pool, now you’re in the pool, you have to figure it out, and that was the first time I actually swam by myself I think. Technique: Had you always planned on attending university in the U.S.? Hammoud: At the end of high school, yeah. I started seeing that swimming in Egypt was not going to be as good with college because it is very hard back home to do them both at the same time. Technique: Why did you transfer from Auburn? Hammoud: The first reason was that Auburn put too much pressure on swimming. They made it too complicated, I think, at least for me. For me, I think I swim at my best when I’m enjoying it and relaxed, and at Auburn I wasn’t relaxed at practice, so I wasn’t training at my best sometimes in the year. The second reason would be academics, of course. I mean Auburn is good, but I’ve been learning way more in class here. Here, we have more outreach to people outside the university; we meet a lot of people here that I didn’t get the chance to at Auburn. I’m meeting people who are successful, and that’s building a great network for me. Technique: Was the transfer a hard transition? Hammoud: Yeah, I think it was a hard transition in terms of swimming. I came from one of the best swimming programs in the country at least throughout the last twenty years to a decent swimming program. The transition could have been harder, but I adjusted very fast. I wasn’t expecting it, but I did. It was hard at some points, but being with the team made it very easy for me to adjust. I don’t know how exactly, but it didn’t feel like freshman year at Auburn. I think being in college for two years already made it not as hard as coming in as a freshman. The challenging part was accepting the change from Auburn to here. In terms of academics, I though it was going to be harder, honestly. I think here is harder; it takes more work, but there are also more resources. It is challenging to do the work, and I think that’s the hardest part — just accepting the change, but it was never miserable. Sometimes I missed my two years there, but I never had that point where I felt like I hate this place and want to go back. Technique: What’s your favorite event? Technique: What are your goals for this year? Hammoud: First, I have to qualify for NCAA, so I can make my goal. Basically, you have to be top 30 in the country or make an A-Cut. Once I get that, I’ll be qualified for NCAAs, which is in March next year. There, I would like to be in the A-Final in the 100-Free, which is my favorite race. Once you’re in the final, you have a very good chance of winning, and if I put myself in the A-Final, I’m giving myself a chance to win. It might not happen, but my goal is to make 100-free final for NCAAs. Technique: Why did you choose to pursue Computer Science for your major? Hammoud: I think it’s the most in-demand job right now. It is the future; everything is going to be computerized at some point. I think back home, it’s not our strongest field of study or field of applying anything. If I learn everything here and get some work experience, I can go back to Egypt and apply what I learned. Technique: Do you have a favorite class so far? Hammoud: Yeah, it was a hard class, but Information Visualization. Technique: Sounds hard, why was it your favorite? projects. Something that I can actually use. Technique: Do you plan on continuing swimming after you graduate college? Hammoud: I would like to. I don’t know how far I would like to go, but I would like to do it, yeah.